Hello everyone! I have a superspecial card for you today…I’ve waited for weeks to share it, and have been chomping at the bit! 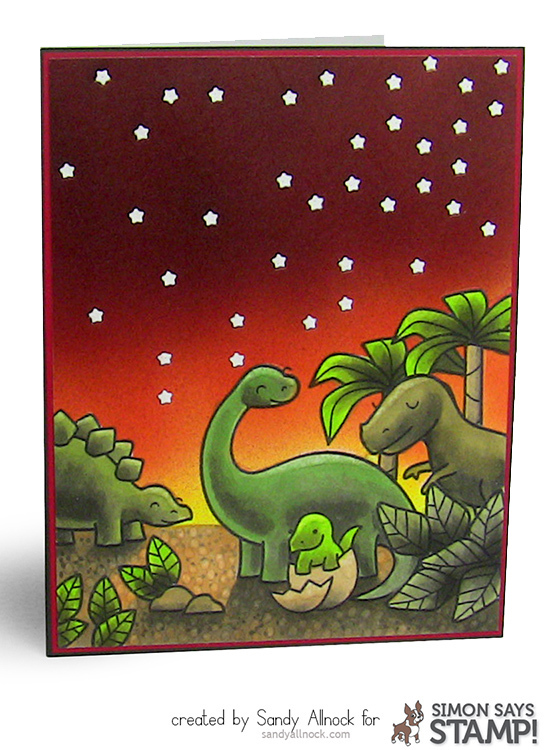 It’s somewhat the result of a dream I had; I’d been thinking about what I wanted to do with the Lawn Fawn dinosaurs for a Simon Says Stamp video, and in my dream, I was walking among dinosaurs with an incredible reddish sky overhead. Very very cool image, so I thought I’d try it with airbrush. This card was surprisingly only my 2nd attempt at it … Instagram followers might remember the peek at the first card – cool, but not as cool as this! In the first portion of the video, you’ll see the airbrush, and the wonderment I had when I peeled off all the masking to see that it actually worked. Yes, it surprised me that I hadn’t wasted all that effort! Great video and card. I am learning so much from you. I like how you added the shadows, texture and what you did with the colorless blender. Thanks for sharing. Happy Birthday Ciara. Your friend will love the card. I love your focus on air brushing! More, please. I have the Copic system and appreciate inspiration. How ’bout the Penny Black Mexican Bird of Paradise stamp? This is beyond cool! Love it! Happy Belated Birthday, Ciara, from our pup Miles! What an absolutely fantastic card. I enjoyed every minute of both your videos – so incredible watching you make it happen. A HAPPY BIRTHDAY to your baby CIARA !! Enjoy the day and each other. Beautiful card. Happy Birthday Ciara! Oh, Sandy, I loved both of your videos especially the second one with the copic coloring. You gave important instruction as you colored telling why and how you were doing certain things. It was so helpful, and yes, I want more videos with you using Copics! Wow. This one truly inspires me. I love the colors, the airbrushing, the stars, and the coloring! Already left a comment on Youtube, but forgot to say Happy Birthday Ciara! I’m not into airbrushing although it looks awesome! I’ll focus on the great example of the ground, plants & dinos. Would love to see how you color images from the SSS Monthly Card Kits! Happy birthday to Ciara – enjoy your swim! Wonderful coloring! really cute card. Fun dino’s!! Love the airbrushing. Happy Birthday to Ciara! Hope that you two had a fun day swimming and doing all the things she loves.